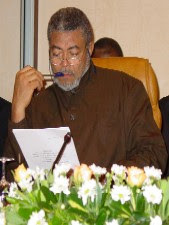 President John Agyekum Kufuor has offered an olive branch to former President Jerry John Rawlings. Speaking to BBC’s hour-long “Have Your Say” programme hosted by Peter Biles, Kufuor said he and Rawlings must let bygones be bygones and forge a relationship on a clean slate. The interview, conducted at the Castle, Osu last Wednesday February 28, would be aired on television, internet and radio on Sunday, March 4, at 2.00pm. A source close to the BBC, told Daily Guide that an avalanche of questions on about 30 pages of internet space were thrown at the Chairman of the African Union (AU) and Ghanaian President. The President pointed out that there had been slips here and there from both sides, but the occasion of the 50th anniversary of Ghana’s independence, in his view, called for a ceasefire and the forging of new beginnings. Kufuor noted, according to our source, that it was in this spirit that he dispatched 8 eminent citizens to the former president to invite him to the celebrations on Tuesday, March 6. He hinted that although Rawlings was yet to confirm his participation in the upcoming events, he was confident that the former president would be part of all the activities lined up for the jubilee in a spirit of oneness. The president, Daily Guide learnt, emphasised his position in his maiden speech in 2001 when he stated that he would treat his predecessor as he would want to be treated. Responding to several other questions, the President stressed his vision for Ghana and Africa. On Ghana, he reiterated that infrastructural development and private sector development were necessary for the rapid development of the country. hese, he said would place it in a competitive advantage over the rest of the world. 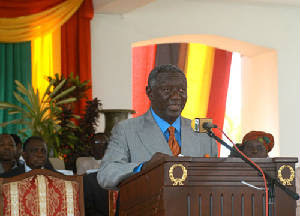 Ghana, he added, was still blazing the trail of leadership, as highlighted at independence. He noted also that his agenda was to show good leadership which would impact positively on its neighbours and other African countries.